You have enough to worry about in college without having to stress out about your finances. U.S. Bank makes it simple. Open a U.S. Bank student checking account and turn your JCCC ID Card into your Campus ID and ATM/Debit Card -- all in one. 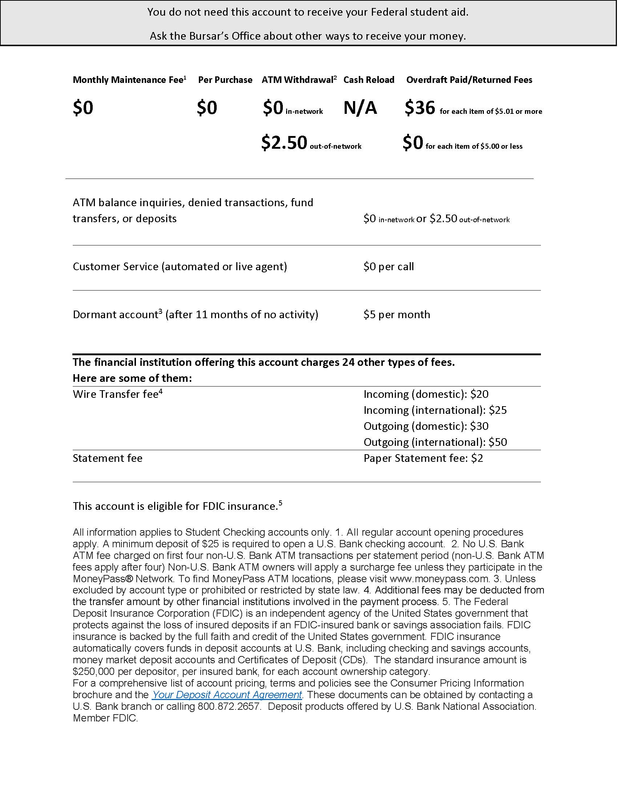 We've made it easy for you to manage your money with a great checking account for students. Learn more about U.S. Bank. For your convenience, U.S. Bank has an ATM in the Student Center and has more than 50 branch offices in the Kansas City metropolitan area including one on the JCCC campus in the Student Center. Your school chose U.S. Bank as its partner to offer students, faculty and staff the option to add banking functionality to the campus ID card. Your school may receive financial support from U.S. Bank in the form of marketing funds, royalties, card stock or other compensation to offset costs otherwise incurred by the school. Students, faculty and staff are not required to open an account with U.S. Bank to receive or use the campus ID card for other campus services. For details refer to the contract governing the partnership between U.S. Bank and JCCC.